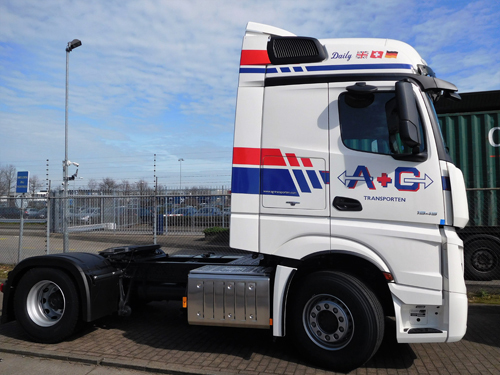 We see ourselves as a no nonsense specialist, down to earth, with a clear focus on solving the international transport requirements of our customers and future customers. Since the start in 1994, when a group of professionals, with ample experience, joined forces, we constantly continued to improve our working methods for the mutual benefit of our customers and internal organisation. The company has made a rapid growth over the past 13 years, where we always have adapted our organization and updated our systems, in keeping the focus on an optimal service for our customers. Staying competitive and maintaining our high service standard is a must, that’s why we have put everything in place to fully comply with our customers demands. We constantly monitor our costs to the benefit of our customers. 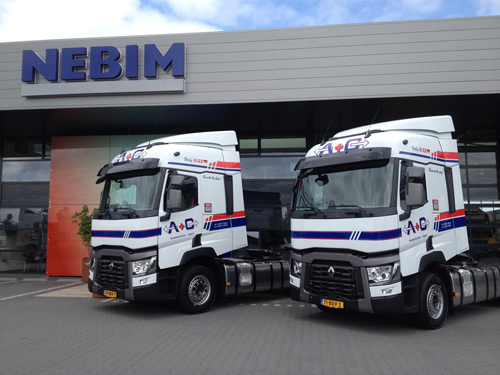 A long standing partnership with all our relations is essential and crucial for us to remain a successful company. That’s the reason why we will do everything within our possibilities, to keep our customers satisfied. 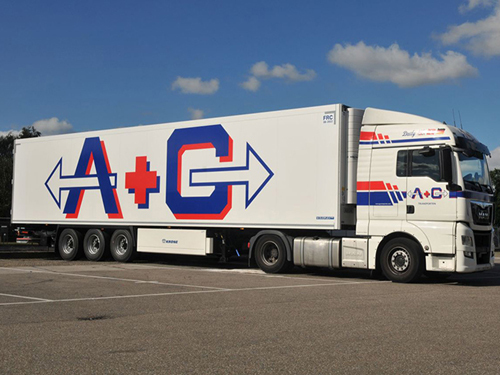 We are an important part in the logistics chain where we are fully aware of our responsibility towards our customers, their suppliers and final customers. 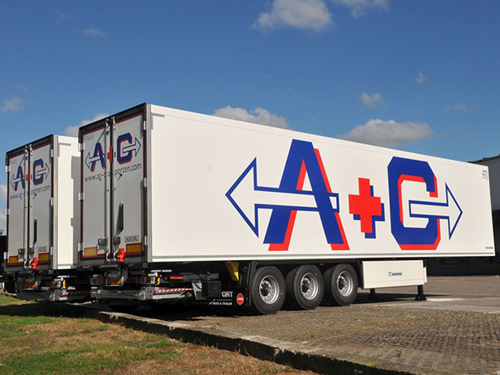 The team at A G transporten feels very confident and is more than prepared, to welcome you as our new customer. To be able to supply the service that is demanded by our customers, it is essential to operate a perfect track and tracing system. Our system is installed with the latest updates and allows us to inform our customers at any time about the actual status of their shipment. Eversince our start-up, we have established a solid bases of customers, satisfied with our overall service and being loyal to our company. Furthermore we have a constant increase of new customers starting to do business with our company. Although we do our utmost to keep our rolling material and our staff in optimal working conditions, we have to be honest in saying that mistakes can happen. But whenever or wherever such an event might occur, we do our utmost to correct this failure and try to minimize the inconvenience that might be caused to our customers. As already mentioned, both internal and external communication are of the utmost importance to keep our high service standard. Reason for us to invest a substantial amount in keeping uptodate with the latest technology, to be constantly informed of the whereabouts of your shipments. 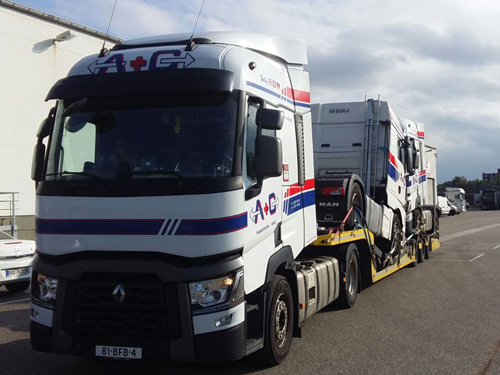 120 Tractor units and 140 trailers. All own Tractor units are working in the Emission class EURO V.
Beside this A G invest in a green solution and on the warehouse has been placed a Solar System generating for the Warehouse and the office buildings the whole Energy needed. 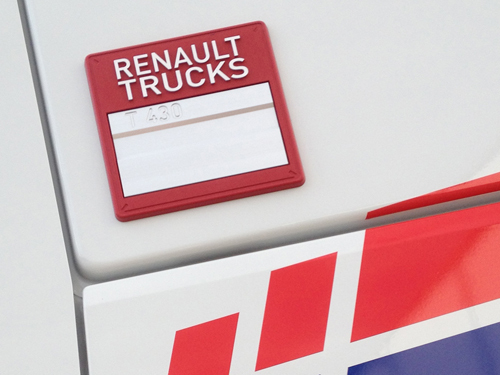 All our trucks are equipped with onboard computer, navigation and telephone system where all destinations can be located via the use of a digital system (wireless RF terminals). 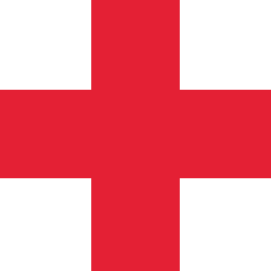 The transport orders can be placed by yourselves via EDI or internet. This process, enables us to follow the status of your shipments, where required, direct via our system. 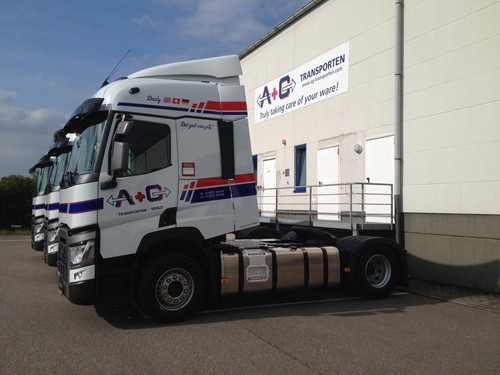 Our trucks are ADR equipped and a high percentage of our drivers are certified to transport ADR cargo. 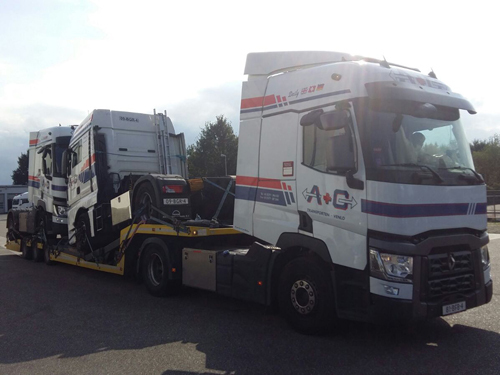 Because of the diversity of our transport fleet, we can fulfill your transport requirements prompt and taylor made. 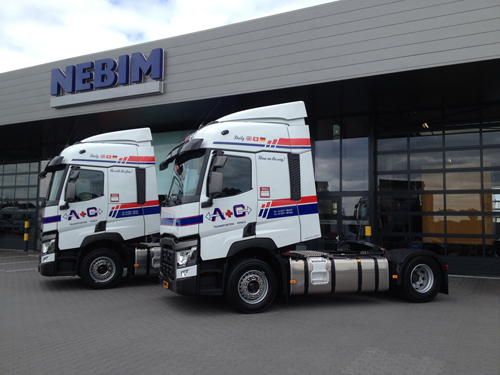 To cope with the increase in demands from our existing and new customers, we are flexible to adapt the number of both trucking units and trailers in our fleet. Maintenance of our rolling equipment has a high priority in our organisation, where we can be proud of a very low percentage of breakdowns if ever they occur. The overall maintenance is managed and operated in-house. 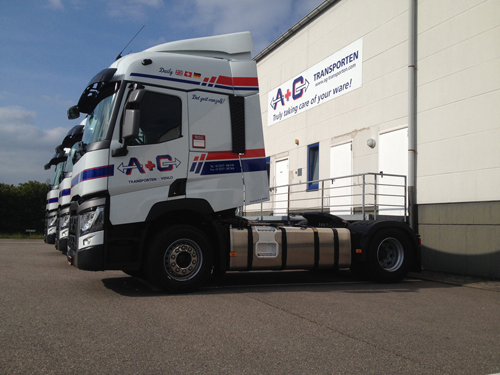 At our work-shop, both trucks and trailers are kept into an optimal technical status and are being regularly cleaned, both inside and out. All this is necessary to keep our promises and fulfill our commitments in a business where we have to be constantly alert. 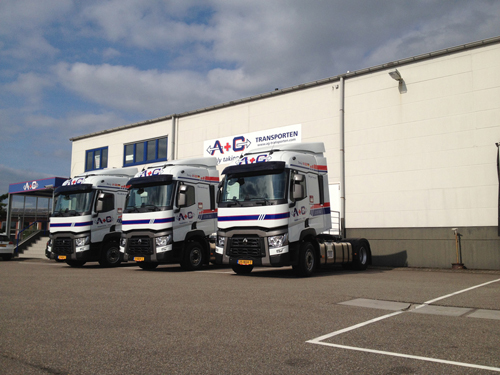 Beside the normal transportation of industrial goods we are although transporting temperature controled goods. 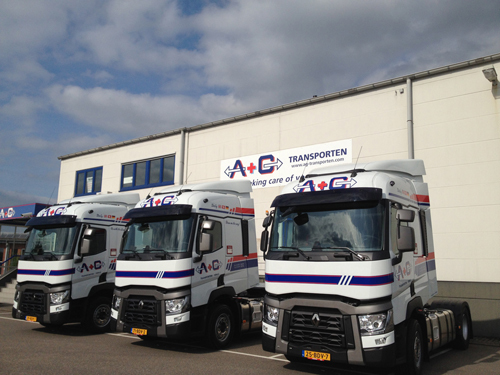 Especially for the Fruit- and Vegetables Industrie we are transporting regulary orders throughout Europe. As well the Flower Industry is our client and mainly we are working out of Netherlands and the Ruhr area to provide the goods throughout Europe. The big advantage in this operation is, that our drivers are talking the native Language at the collection and delivery points. On request we are providing the temperature print for these transports. As well the empty return of CC-Container can be provided throug us. Are you looking for Storage??? You need for your goods Warehouse capacities / at our Warehouse in Nettetal (D 41334) space is available. Space of 5.000 sqm is possible including the warehouse management and transports behind. 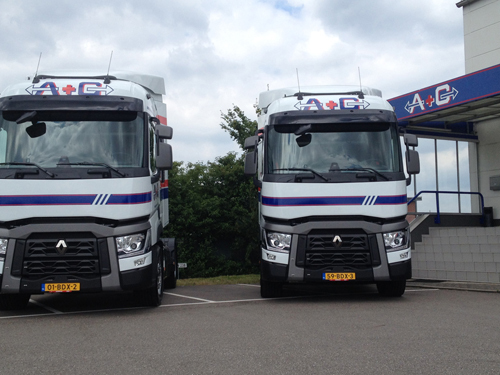 Our premisses are secured 24 h a day and for rent is also possible to park Trailer or rent office space.